This is a story written by a girl named Pat Bonney when she was ten years old. It was published in the newspaper in 1937 and I have just read it for the first time. Why would I be interested in a story three quarters of a century old? Pat was my mum! 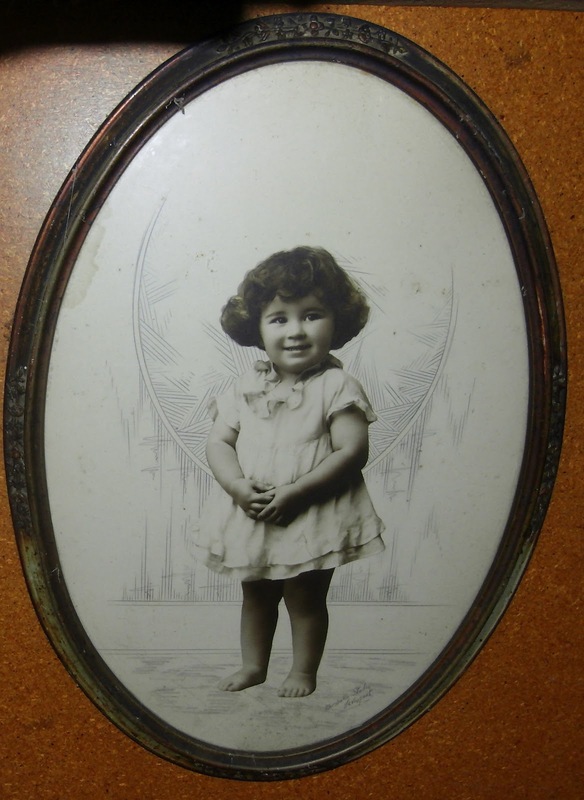 The accompanying picture shows her as a small child. "BOTHER homework," sighed Jill as she rubbed her eyes. In a moment she was flying through the air on the back of a green and gold rosella parrot which seemed to be in rather a bad mood, because when Jill asked where they were going, he only grunted. At last he condescended to mutter, "The Queen of Wattles sent me to bring you to Fairyland for her birth day party." Soon they came to a beautiful wattle tree, where the parrot dropped his wings and they floated to earth to a most beautiful gully, with a rippling stream flowing through. Jill felt a little shy, but she bowed to the Queen, who was clothed in gold, and surrounded by wattle fairies. Suddenly there was a disturbance on the little stream, which proved to be the platypus arriving with the water lily fairies. No sooner had they arriv ed than the kangaroo came bounding along laden with the orchid fairies. There were sun orchids, green hoods, brown beaks, gnats, rabbit ears and butterfly and spider orchids, also many others that Jill did not know. Soon after, the wallaby came with the heath fairies in their pink, white and red frocks, while the opossum followed with the gumnut fairies. After bowing to the Queen, all the fairies danced merrily round her untilmidnight, when they sat down to a fairy supper served on toadstools. Suddenly Jill felt a bump. She thought that the kangaroo had col lided with her, but opened her eyes to find her pen in her hand, and she heard her brother say, "Wake up, sleepy head, you can't do your home work in your sleep." Today, as promised, I welcome Sally Murphy to Spinning Pearls to answer some curious questions about her new picture book. 1. The title of your new book is “Do Not Forget Australia”. Can you name three things you would never forget about Australia if you had to leave? - Our beautiful landscape – hills, forests, plains and, of course, the beaches. Oh, and the smell of the gumtrees. - The light. The sun and sky in Australia have a special white brightness that the rest of the world seems to miss out on. - Our freedom. Oh, Australia has its problems (like every country) but, in the main, Aussies are free to follow their dreams and beliefs. We are so very lucky. 2. How did you come by the idea of connecting the two boys in your story via an adult character? A. From very early on I had the idea of two child characters – one in each country - but it took a while to figure out how to connect them in a way which was feasible to the time. I had thought to have them as penpals, but had trouble with making that authentic. Then, as I thought about the fact that there were Australians stationed there in France, I realised it was quite feasible for an Australian child to have a soldier father there. 3. Had you ever worked with Sonia, your illustrator, before? If so, on what projects? A. No, I hadn’t worked with Sonia before, though I had seen one of her covers and admired it. And when Walker Books sent me samples of her work and asked me if I thought she was a good match for this story I said an emphatic ‘yes’. 4. “Do Not Forget Australia” was several years in the making, so you must have had definite mind’s eye views of the characters. How did Sonia’s interpretation match your mental pictures? A. Funnily, I am not really a visual thinker so don’t tend to have very set ideas about how a book should look. The mental images I had were mostly from photos I’d seen whilst researching, and I love the way Sonia has drawn on photo references. Her style is perfect (in my opinion) for the story. I couldn’t have asked for more! 5. Was the story always going to wear this title? How did you arrive at the title?
. A. Yes, the story had this title right from the beginning. It was the sign bearing the words ‘Do Not Forget Australia’ that inspired me to research and write this story, and I didn’t ever consider any other title. Fortunately, there was never any discussion about changing the title – which is something that does tend to arise with a lot of stories. Thanks heaps for having me, Sally. It’s great to be out and about talking about the book without even leaving home. Thank you, Sally! You can follow Sally on her blog tour by visiting the sites below. Please leave a comment for a chance to win a copy of this beautiful book, donated by Walker Books, the publisher. The prize draw will be made on March 14th. Hi, everyone! On March 7th, Spinning Pearls will be meeting Sally Murphy as part of her blog tour for her new picture book, DO NOT FORGET AUSTRALIA. You can follow the tour at these venues.